Theme: Let there be life!!! Presider: Let us pray as we come together to break bread and share the blessings we have received from our God through the example of Jesus on earth. Through the Holy Spirit, may we learn to love as he did, everyone he met. May we open our hearts to the planet on which we live, wherever we are – and the people we encounter, whoever they are – in this one world. 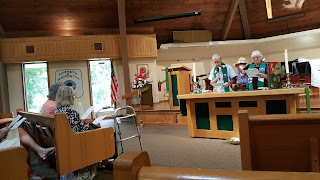 Opening Song: “All Are Welcome” #414, verses 1, 2 and 3. All: Help us to extend your forgiving presence that is your gift in us to all those people with whom we live, with no exceptions. All: (with an outstretched arm): God, the Father and Mother of mercy, through Jesus’ life, death and resurrection, he bonded the world to you. He sent the Holy Spirit to move among us and all creation. May that Spirit give us the wisdom to love you – and the courage and compassion to love one another. Merciful God, teach us the virtues of pardon and peace so that we may – in turn – learn to forgive our failures to care for one another and for our planet Earth. We ask this in the name of Jesus, our brother and of the Holy Spirit, our healer and comforter. Amen. All: Glory to God in the highest, and peace to all God’s people on earth. Creator God, heart of the evolving universe, we thank you for the breath of the Spirit sustaining everything that exists, everywhere in the cosmos. Through the example and teachings of Jesus Christ, you gave us the grace to know that you are always among us – and that we can experience you in our brothers and sisters. We give you glory and praise through Jesus Christ, our brother, and the Holy Spirit, our Wisdom. Amen. First reading: 1 Kings 17: 17-24 All: Thanks be to God. Second reading: Galatians 1: 11-19 All: Thanks be to God. Gospel Acclamation: Alleluja (celtic version) Before and after the gospel reading. Presider: We are a people of faith, believing in the power of prayer. We are always mindful of God’s unconditional love and care for all of us. And so, we bring the needs of thepeople – throughout the world – to our merciful and gracious God. After each intercession, respond: Compassionate God, hear our prayers. ALL: Merciful God, we are united in this sacrament by our common love of Jesus. We are in communion with everyone, everywhere, who proclaims your mercy, especially to all those who are marginalized and oppressed. May we love tenderly, do justice, and walk humbly with you in solidarity with our brothers and sisters. May we live as prophetic witnesses to the Gospel, supported by the vision of Jesus and the wisdom of the Spirit. Amen. All (sung): Holy, Holy, Holy God, God of power, God of light. Heaven and earth are full of our glory. Hosanna in the highest. Blessed are all who come in the name of our God. Hosanna in the highest…Hosanna in the highest. Voice 3: When his time had come, Jesus suffered for the values he deeply believed and taught…his conviction that love is stronger than death. And then, as an example this insight for the ages to come, he opened wide his arms and died. The Spirit, who raised Jesus from the dead, showed us that life is eternal and love is immortal. Jesus is with us today as he will be through the end of time. Closing Community Commissioning and Hymn “Be Not Afraid” #430. 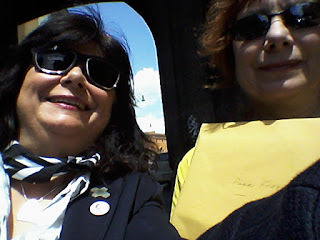 Please note: Janice and Christina will write their about their experiences at the Vatican, Check blog. 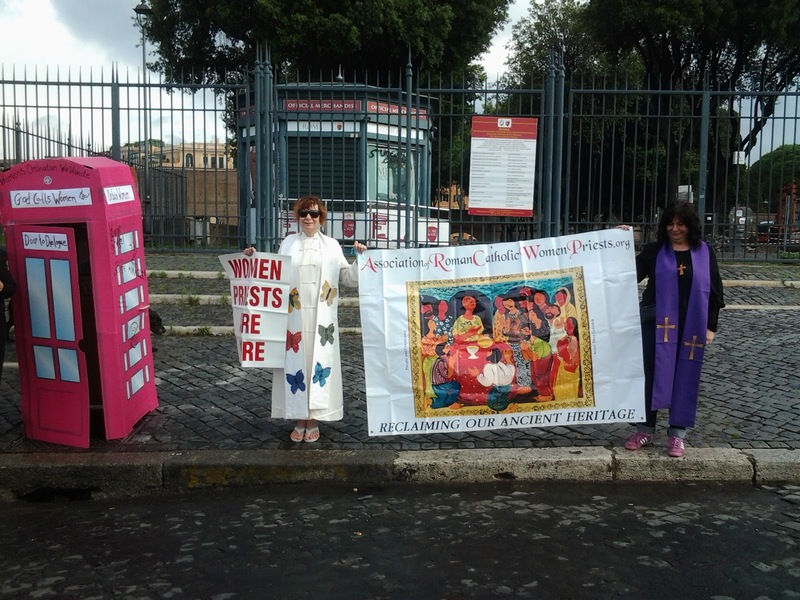 Women's Ordination Worldwide leaders and Irish Priest Tony Flannery march for women priests in Rome. serve in ordained ministry currently reserved to men. All across the Mediterranean, early Christian frescoes and bas reliefs carry the names of women deacons and even bishops — such as Phoebe, Helaria, Ausonia, Euphemia and Theodora. Yet in 1994, Pope John Paul II not only decreed that women are definitively excluded from the priesthood, he even banned all discussion of the topic. Pope Francis broke that taboo last month when he announced he would create a commission to study whether women can serve as deacons as they did in early Christianity. 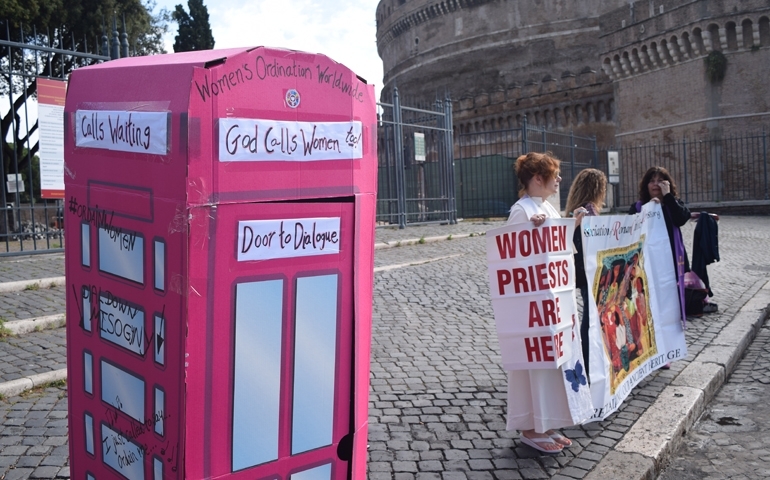 Seizing this new sign of openness, supporters of a female priesthood converged on Rome this week, to coincide with the Vatican's Jubilee for the all-male clergy. Marinella Perroni, a theologian and New Testament scholar who teaches at a Pontifical College in Rome, was one of the participants on a panel. She recalled that John Paul's 1994 edict even urged students to report errant teachers. "In Rome, several professors were denounced to the congregation of the doctrine of the faith," she said. "This had immediate consequences on their right to teach and it led to paralysis." Posters touting the Women Priests Project along a wall. Father Tony Flannery, whose support for women priests was one reason the Vatican suspended him from public ministry, also took part in this week's discussion. He rejected the claim that since Jesus' disciples were male, only men can minister the sacraments in persona Christi, or "in the person of Christ." "Now that is such a ridiculous argument," he said. "In fact, that argument has its rightful place back at the time of the flat earth and the persecution of Galileo." Panelist Jamie Manson, columnist and book editor at the National Catholic Reporter, said a female priesthood would be an important signal in a world where women suffer disproportionately from violence, poverty, lack of education and trafficking. "Imagine if a church of one billion people, with this charismatic, rock star pope, suddenly said to the world, that women are equal to men," Manson said. "Imagine the power that would have over cultures across the world, where this patriarchal idea of women's subservience to men is at the root of all that women suffer globally." 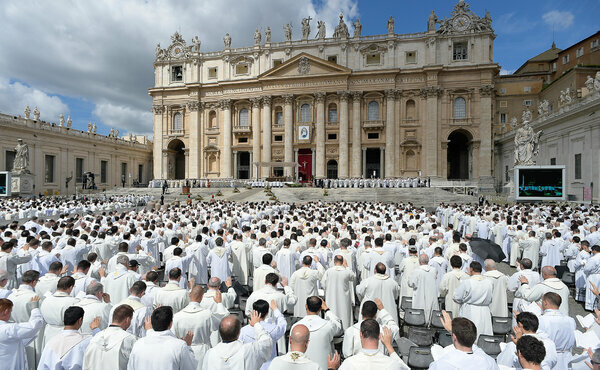 Pope Francis celebrates a Jubilee Mass for priests in St. Peter's Square at the Vatican on Friday. 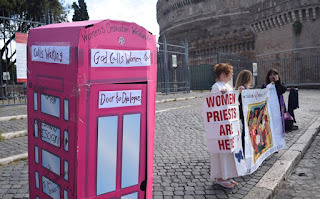 The next day, the organizers of the unofficial jubilee of women priests gathered in the shadow of St. Peter's dome in their first official public demonstration in this city. There are some 150 women worldwide who function as priests, in defiance of the Catholic Church. 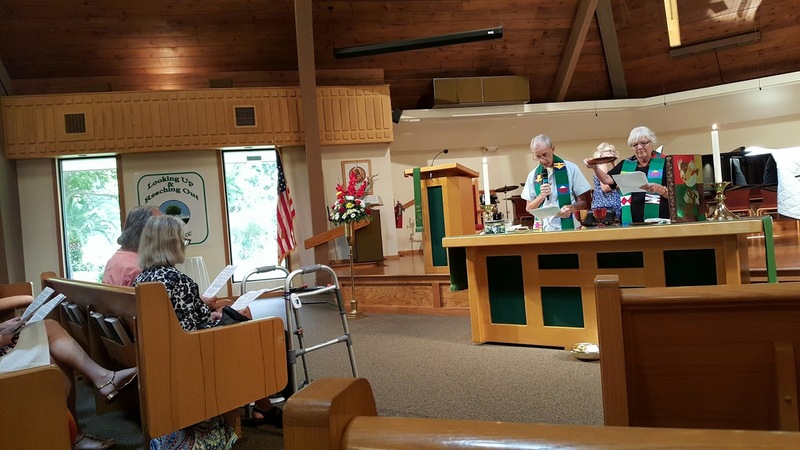 They perform baptisms and weddings and celebrate mass in house churches. But after Pope Benedict issued a decree in 2010, all those women were automatically excommunicated from the church. 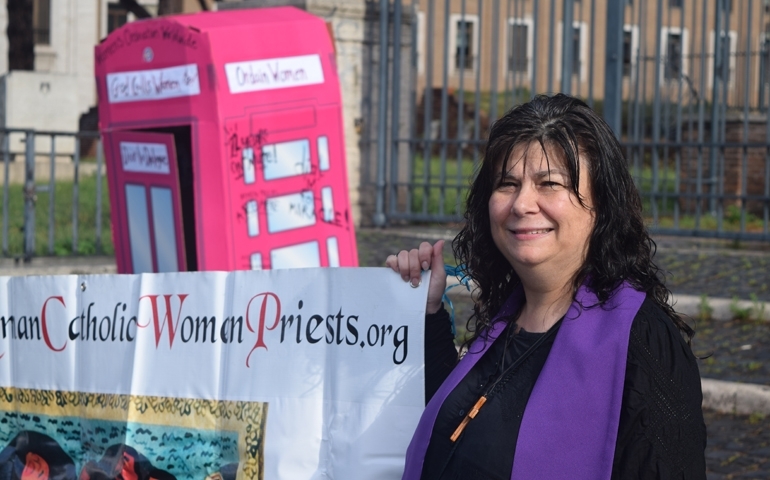 Some of those pioneering women priests also came to Rome this week, and they scored another first. Janice Sevré-Duszynska, who was ordained by a bishop in Kentucky in 2008, says she and another woman were received by an official in the Secretariat of State, one of the Vatican's top departments. "We talked to a wonderful priest, we were able to give our letter to Pope Francis, our petition to lift our excommunciations and stop all punishments against our supporters as well as begin a dialogue with women priests," she said. While we spoke, police officers approached. 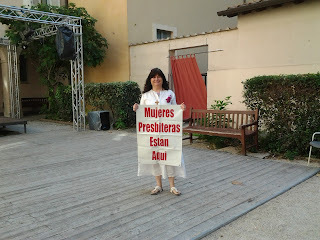 A policewoman in civilian clothes asked, "You're here to promote the role of women in the church? To let women become priests like men? Put them on an equal footing?" When asked what she thought about this, she laughed and said, "Oh, I'm just a police officer." But it does seem the policewoman went out of her way for this group. She and her men escorted the protesting women all the way into St. Peter's Square, where Pope Francis was preparing to celebrate mass for thousands of ordained male priests. Bridget Mary's Response: A Warm Reception by the Vatican! as Worldwide Ordination Meets and marches in Rome. 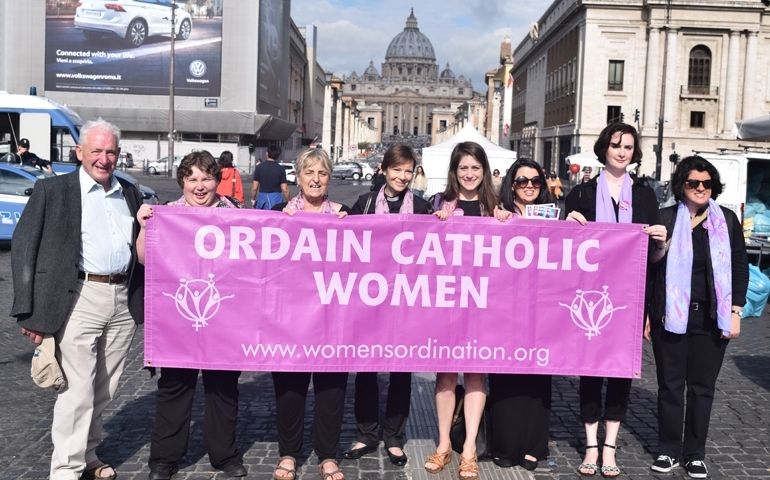 Advocates for the ordination of women to the Roman Catholic priesthood marked the 20th anniversary of the founding of their movement in Rome with a three-day conference that culminated today with a pilgrim's walk down the Via della Conciliazione to St. Peter's Square. 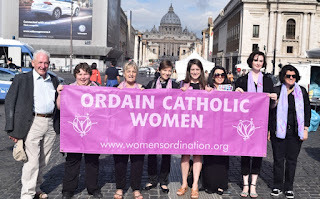 Women's Ordination Worldwide, or WOW, a coalition of international groups supporting women's ordination, hosted the meeting and march in Rome to urge church leaders to re-open a dialogue on the question of ordaining women, which Pope John Paul II closed 22 years ago with publication of his apostolic exhortation Ordinatio Sacerdotalis, "on reserving priestly ordination to men alone." The "Open the Door to Dialogue" conference June 1-3 coincided with the Vatican's Jubilee for Priests and Seminarians, part of the official celebrations marking Pope Francis' Jubilee Year of Mercy. "We thought that the Jubilee for Priests was a perfect time to really give an offering and a celebration for all women called to priesthood," said Kate McElwee, co-executive director of the Women's Ordination Conference, the U.S.-based member of WOW. "We really wanted to have this as a celebration and a serious conversation of women in the church." 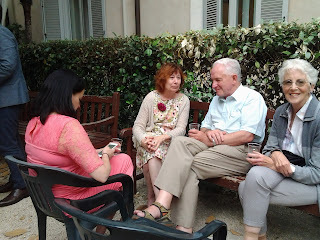 The centerpiece of the "Open the Door to Dialogue" conference was a five-person panel discussion and a question and answer period in Rome June 1 at the Casa Internazionale delle donne, a center for feminist movements, located just steps down the Tiber river from the Vatican. Check out all the great products NCR has to offer! Visit our online store now. Almost 60 people attended the two-hour panel discussion, which included people with professional and personal experience with women in ministry. One panel member, Tony Flannery -- an Irish Redemptorist priest who was removed from active ministry* in 2012 for his support for female priests -- compared the church's current stance on women's issues to the Middle Ages. "I am becoming increasingly convinced that the inequality of women is becoming a major issue and a major challenge facing the Catholic church, and, unless addressed, [the Church] will continue becoming more sidelined and little more than a sect," Flannery told NCR. 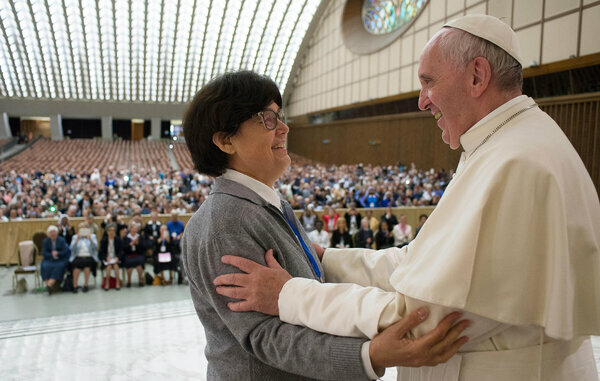 Pope Francis' recent announcement that he would create a commission to study the history of female deacons in the Catholic church -- a hot button topic among members of the church -- was also brought to the table Wednesday, June 1. Flannery offered only positive feedback to the announcement. If women eventually are ordained as deacons, he said, parishioners will no longer distinguish between males and females performing liturgies on the altar. "They wouldn't see a significant difference. I think it would be a big step forward." Panelist Jamie Manson, who is NCR's book editor and a columnist, offered a different perspective. "The establishment of women deacons, I think, runs the risk of being a compromise that ends up trapping women in a role in which they will continue to be subservient to men, particularly in service to priests," she said. Panelist Marinella Perroni, a professor of the New Testament at Pontifical University of St. Anselmo in Rome, offered three points during her introduction Wednesday, including the ecclesiology of the Second Vatican Council, which "brought to light the necessity of re-thinking the theology of Catholic ministry," she said. "I was always convinced that the church of Vatican II must come to de-clericalize ordained ministry, liberating it from the weight of sacrifice. Instead, the terror of a possible Protestantization of the Catholic church has blocked the reception of Vatican II and radicalized the theology of ministry as the stereotypical post-Tridentine ones," Perroni said. "Personally, therefore, I would prefer that women would aspire to ordained ministry rather than priesthood. The Rev. Dana English, a panelist and assistant curate at All Saints' Anglican Church in Rome, called Perroni's remarks "extraordinary." English, who's been ordained for 32 years, told NCR that open dialogue -- like the one the conference presented -- is a necessary step in continuing the presence of women in the public eye. "If the voices continue to be clear and loud and frequent, both by presence and by voice, I think this issue can continue to sink into the public consciousness," said English. "The traditional structures are going to have to break down in the next 10 to 20 years." Italian photographer Giulia Bianchi, also a panelist at Wednesday's conference, has spent the past three years photographing more than 70 excommunicated female priests -- work that has taken her as far as New Mexico and Colombia. 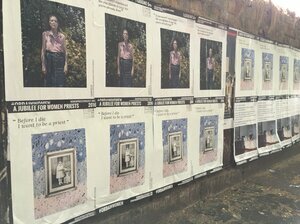 Bianchi's photographs, titled "Women Priests Project," have been printed as three-foot bill posters and are on public display around St. Peter's Square and the Trastevere district in Rome. The posters are to be on display until June 8. Her work is more than just a picture, she said, but instead a call to women to break down the barriers created by society. "The women priests are fine. They don't need my help. They don't need my photographs. I do my work for women that aren't empowered ... That think they aren't as good as a man," Bianchi told NCR. "There is nothing more important for spiritual people then to feel their spirituality is as big and as mystic and as profound as the spirituality of the man." About 20 people gathered Friday in Piazza Pia at the far end of the boulevard that runs into the plaza outside St. Peter's Basilica, where a Mass for the Jubilee of Priests was beginning. The Women's Ordination Worldwide supporters dressed in purple stoles -- a symbol of women's ordination -- and carried signs that read, "Women priests are here." They also had a cardboard replica of a telephone booth that was labeled, "Door to dialogue." WOW organizers had a permit for their demonstration, making it, they say, the first legal demonstration for the group in Rome. "We walked down the pilgrim's path toward St. Peter's and joined the Mass for priests," McElwee toldNCR. 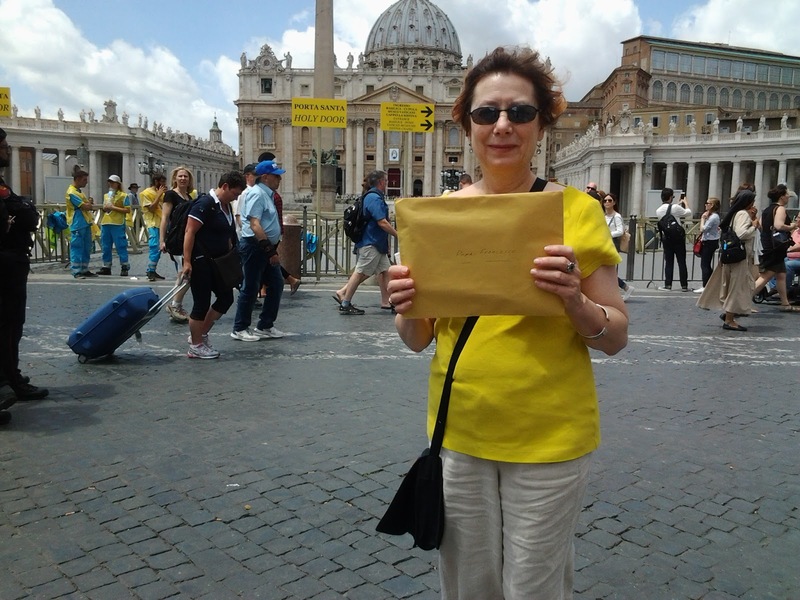 "However, the women priests with us had their stoles and signs taken away, as well as our leaflets and pins."